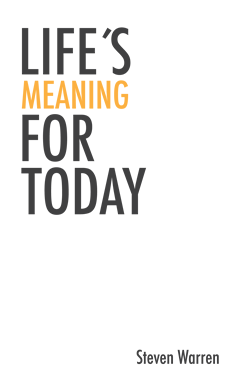 Life's Meaning for Today 2nd Edition and related publications by author, speaker and broadcaster Steven Warren can be purchased here on line as well as from Amazon and Lulu. 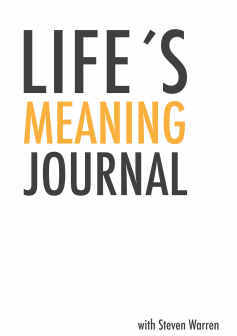 Life' Meaning for Today print ebook (Kindle and epub) Lifes Meaning Journal print Life's Meaning for Today audio Life's Meaning Calendar. Publication Date: 10th July 2012. This book first appeared not in print but on the internet in the form of a daily quote for life's daily meaning. By meaning I refer to the fact that every day out life unfolds another aspect or element of True Self emerges if only we stop and take the time to recognise what it is that is being reflected back to show who we really are and discover another facet of our being. Just over a year since the publication of the first edition the new edition contains a host of new quotes for daily life. Enjoy using this short book at many levels as your make the necessary changes to step forward to the next unfolding stages of your future life. The quotes which are included in this journal first appeared not in print but on the internet in the form of a daily quote for me to use for life's meaning to day. By meaning I refer to the fact that every day our life unfolds another aspect or element of True Self emerges if only we stop and take the time to recognise what it is that is being reflected back to show who we really are and discover another facet of our being. In creating the book "Life's Meaning for Today" I took each of the various days quotes and combined them into one printed and on-line book making it possible to select a page at random and read a statement which reflects back an important element of your True Self operating at that moment in your life. "how do I respond to events as I see them from a new perspective?" My answer is to allow yourself time to reflect on what you are now experiencing from an expansive way of thinking about and relating to your daily waking life. Enjoy writing your thoughts, reflections and plans in your journal at many levels as you make the necessary changes to step forward to the next unfolding stages of your future life. "words of wisdom that touch your heart"
"a daily dose of truth"
2nd Edition Steven Warren Publication Date: 13th August 2012. Read by the author - Steven Warren AUDIO BOOK Version due for release April 2014 on Amazon.